This is the scheduled three-weekly post for the SAL that I’m doing with several other crafty blogs. This is where I got to last time. 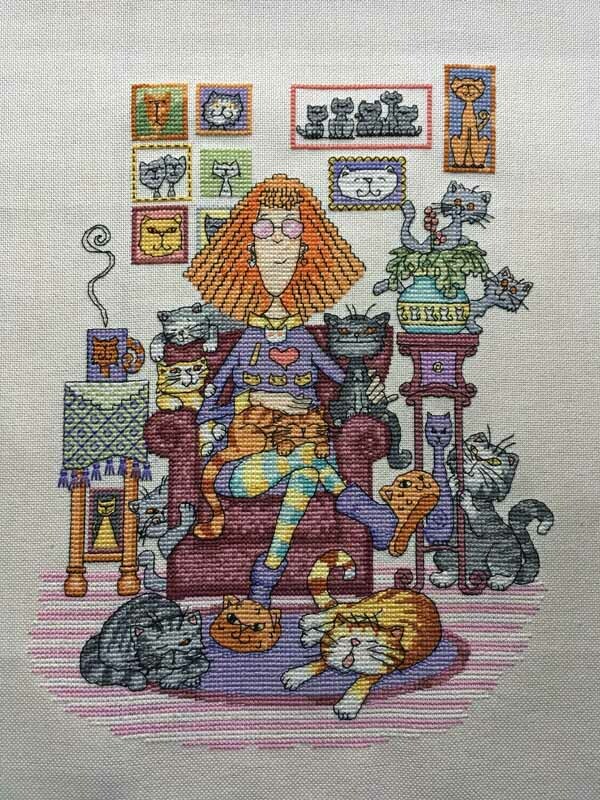 It was so close to being finished and this time I am doing that happy dance. This is it finished in all its glory. I love the look that the grey tabby is giving to that slipper! 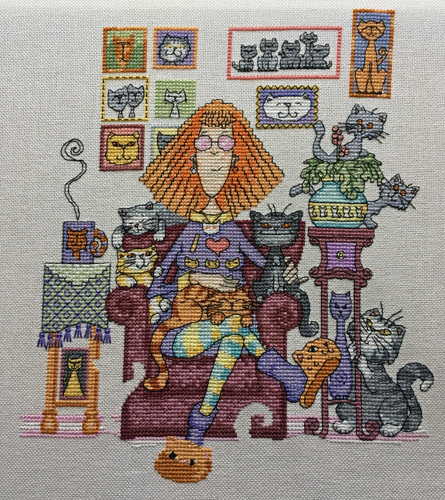 There should be a line of text beneath the picture, reading Crazy Cat Lady, but I’ve decided that I prefer it without so I left it off. The kit was from Heritage Crafts and the chart was excellent, being very clear and easy to read. 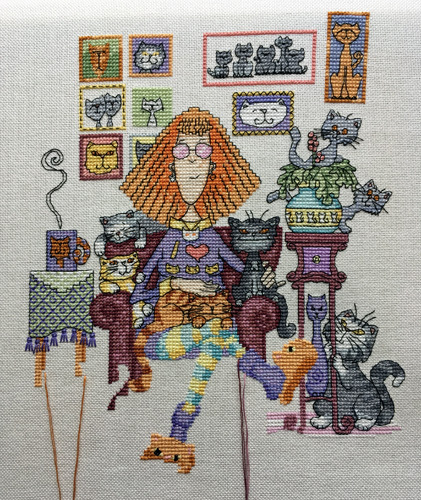 The straddled cross stitches and different partial stitches made it a bit more challenging than some projects but it also made it more interesting and fun to do. I did replace the supplied 14 count Aida with some nice 28 count evenweave, which made all the partial stitches easier to do, plus I much prefer the look and feel of it. 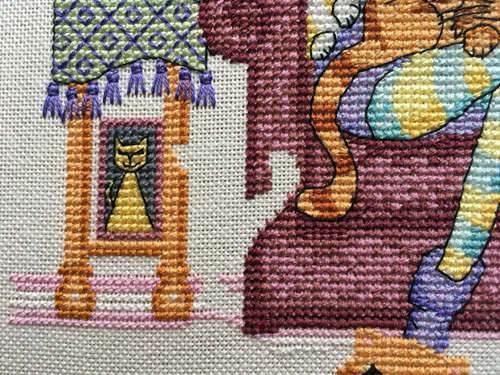 I loved that there was a separate chart for the backstitch, so the lines didn’t obscure the partials. My next project is all ready to start. 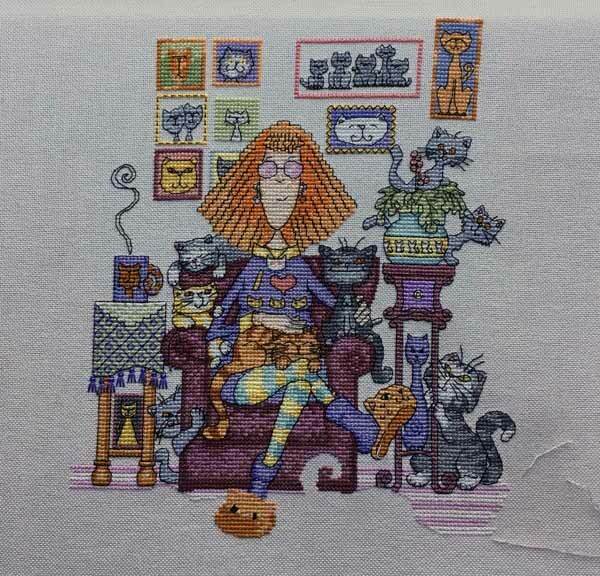 It’s from one of my favourite designers and is quite different to Cat Lady. Hopefully I’ll have some progress to show you on that in three weeks. 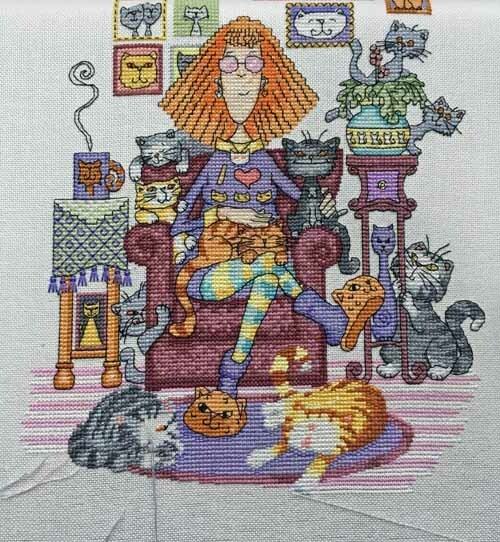 Categories: Cross stitch | Tags: Crazy Cat Lady, Cross Stitch, Heritage crafts | Permalink. This is where I got to last time. I’m really pleased with the progress that I’ve made this time. Look, there are almost two more cats! 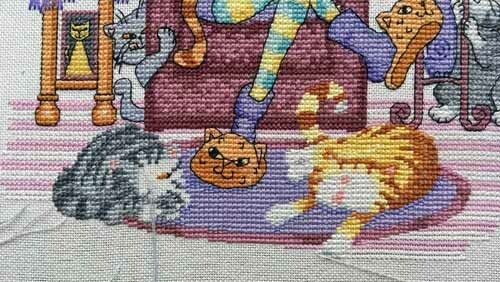 The grey cat needs a bit more cross stitch and they both need to be backstitched, but once that’s done, there’s just the rest of the pink & white stripes plus some text and it’s done. I’m really hoping to have a happy dance next time. This is the whole thing at the moment, or as much as you can see on the scroll frame. 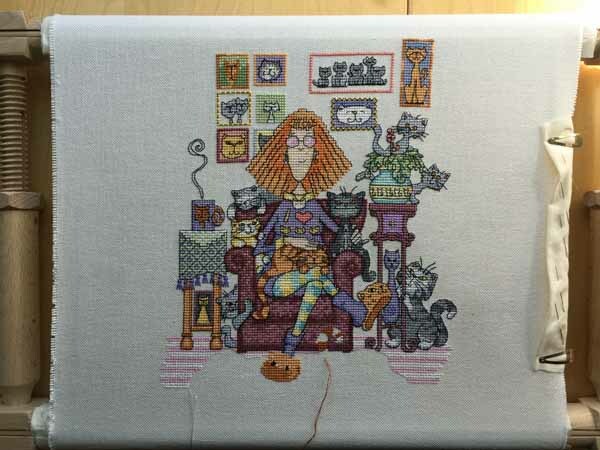 I can’t wait to get the faces stitched on the two new kitties. This is where I got to last time. And this is where I’m up to now. At least you can see where I’ve stitched this time though. This is where I got to last time. I didn’t get much done for this update, but there is a new cat and a bit of floor. I know I say this every time, but I am hoping to get more done for the next update. This is where I got to last time. And this is where it’s up to now. 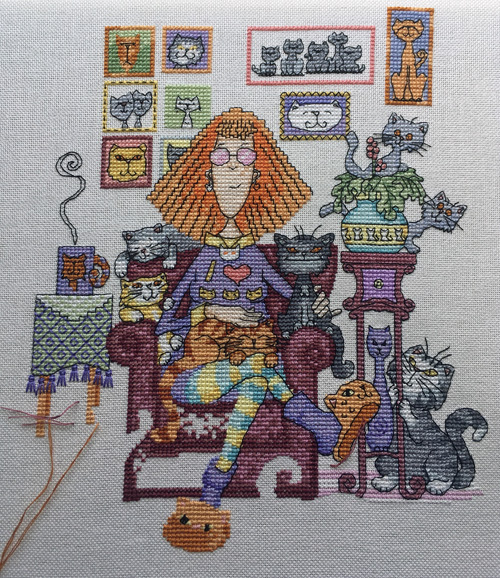 I’ve managed to get the backstitch done on the right, including that slipper and have started working on the chair. 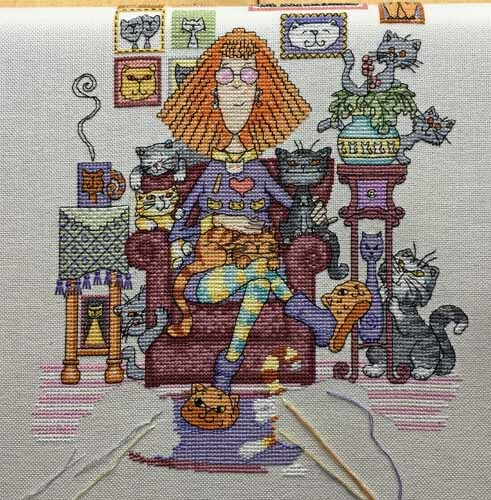 Her legs look a lot better for that backstitch and I’m hoping to finish the chair and the rest of the backstitch on her legs by next time.